The first part of this year has seen me working on some photography projects, now time to get the soldering iron out. I have three projects I’m hoping to complete this year and one long term project that may take me a while, so pay attention 007. A few weeks ago I received a couple of Oaks. These boards are based around the ESP12 module, a Kickstarter project I backed at the end of 2015. The project aimed to make working with the ESP12 easier by providing integration with particle.io. The latest firmware was release a few days ago so I think it is time to give this little device a go. At the start of the year we came across a weather meter which allowed the measurement of rainfall, wind speed and wind direction. My wife mentioned that it might be nice to use one of these to record the weather in the garden. And so the idea was born, weather meter, meet the Oak. I have coloured each block of concepts the same colour in order to give the project some structure. Let’s look at each block in turn and see how we can approach the problem. Starting with the green block and five o’clock on the diagram. There are two temperatures we can measure here, air temperature and soil or ground level temperature. The air temperature will give an indication of how pleasant a day it is at the moment and the ground level sensor will give an indication of the progress of the seasons from the plants perspective. For this reason we are interested in both of these measurements. Air pressure has long been used as a predictor for upcoming weather events. Luckily we can get the air temperature, pressure and humidity sensor in one convenient package, the BME280. Ground level temperature will need a waterproof sensor. I think this would be best purchased as a unit rather than made so the DS18B20 with a 6 foot cable looks like it might be ideal. All of these measurements come from the weather meter. The wind speed and rainfall sensors are simple switches that generate pulses whilst the wind direction is a resistor network. The two light measurements are the overall light intensity (luminosity) and ultraviolet light intensity. Luckily there are a couple of sensors for these two measurements, the TSL2561 and the ML8511. The ultraviolet light sensor is an analogue sensor and so we will have to consider the stability of the supply voltage when making the reading. 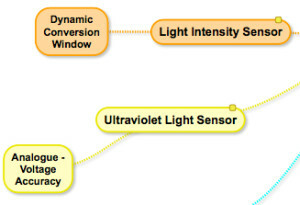 The luminosity sensor uses a measurement window and a sensitivity setting to take a reading. This means that for given settings the sensor may be overwhelmed and simply give a maximum reading. The work around for this is to make the measurement window and sensitivity dynamic. So long, sensitive windows at night and short less sensitive windows on bright sunny days. The microcontroller and power etc. will need to be located in a case of some form. This will need to be weather proof as water and electricity are not the best of friends. It would also be a good idea to keep any batteries in an environment with a reasonably stable temperature. 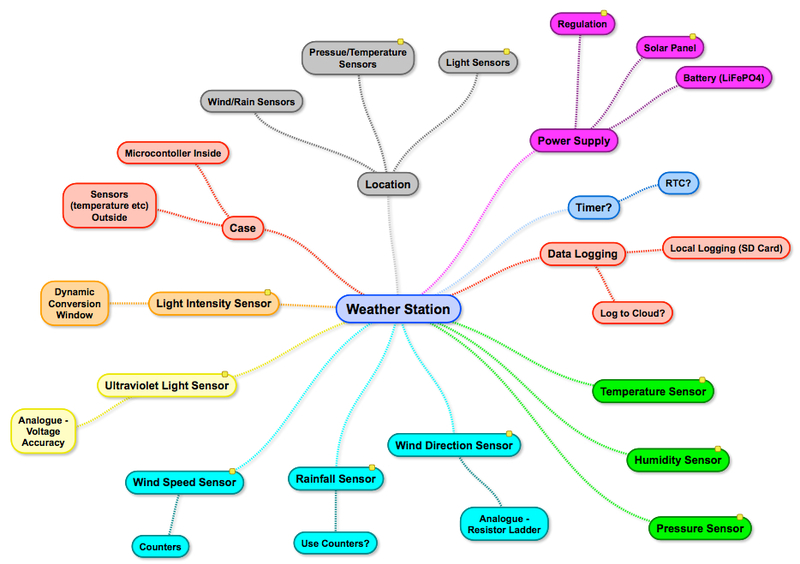 A little research into how the professionals house weather Stations. 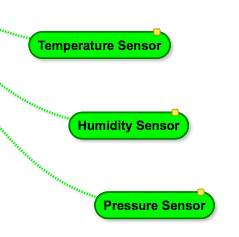 The sensors on the other hand need to be outdoors in a suitable location for the measurements being taken. The initial work can be done using a bench power supply but when the project moves outdoors it will need to either be mains or battery powered. 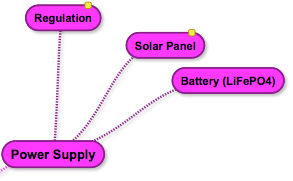 The long term aim is to use a solar cell and rechargeable battery, as they say on Kickstarter, a stretch goal. The Oak is a WiFi enabled board so the most obvious place to put the data is the cloud. It might be an idea to also provide some local storage in case the WiFi network is unavailable. 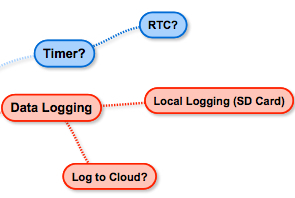 The Real Time Clock (RTC) could have two uses, to wake the microcontroller and also provide a timestamp for the data items. The measurements should be collected and reliably logged either locally or preferably to the cloud. There are several challenges with a number of interesting problems to overcome. ESP8266 boards offer an amazing opportunity to explore the IoT world at a low cost. The boards start for as little as £5 here in the UK and come in a variety of form factors from one with only two GPIO pins to larger boards containing more GPIOs, PWM, I2C, SPI and analog capability. The boards started to become noticed around the middle of 2014 and have become more popular as the tools and documentation have matured. Support for the boards is mainly through the online community forum. The latest documentation and SDKs can be found through the same forums. The boards make low cost networks of sensors a possibility with the ESP8266 modules acting as either small servers or clients on your WiFi network. For the purposes of this exercise we will look at replacing the default firmware supplied with a custom application. The SDK available from Expressif allows the developer to program the module using C. First thing to do is to install the tool chain for the module. The ESP8266 Wiki contains a host of information including instructions on setting up the tools on a variety of platforms. This whole process took about 2-3 hours on my Windows PC with another few hours to put together a template for a makefile application for Visual Studio. 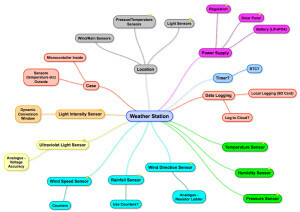 Now that the development tools are in place we can start to think about the sensor network. Security is a major concern for Internet of Things (IoT) projects but this proof of concept will ignore this for the moment and rely on the WiFi encryption as the only mean of securing the data. This is a proof of concept afterall. The applications developed here will allow data to be transmitted using UDL over the local area network. Create a new Windows console application on the PC and add the above code to the program.cs file. When run, this application will listen to the local network and display any UDP packets as a string to the console. Nothing special but good enough for the purposes of this experiment. //  Callbacks for the OS task queue. //  User function which will be added to the task queue. //  Initialise the application and add the user task to the task queue. Compiling and deploying this application will result in a module which does nothing much other than wait. Unlike some of the other modules and boards discussed on this blog, the ESP8266 does not have much available in the way of debugging. Code will need to be added to the application to output debug information on GPIO pins in order to get feedback on what is going on inside the application. The ESP01 module being used has two GPIO pins available, GPIO0 and GPIO2. We can use these to output serial data akin to SPI and then use a logic analyser to examine the application state. Adding the code below will allow us to do this. //  Initialise the GPIO pins. //  Set GPIO2 and GPIO0 to output mode. //  Bit bang the data out as serial (SPI) data. //  Set the clock and data bits to be low. For the proof of concept the application can simply generate a regular packet of data emulating the presence of sensor data. The most cost effective (in terms of power) way of doing this will be to use a timer of some sort. //  OS Timer structure holding information about the timer. //  Timer function called periodically - try communicating with the world. //  Set up timer to call the timer function. //      - timerInformation is the pointer to the OS Timer data structure. //      - 1000 is the timer duration in milliseconds. Adding the above code to the basic application should generate data on GPIO0 and GPIO2 every second. The last part of the puzzle is to connect the board to the local WiFi network and to start to send data across the network. // Not connected yet !!! //  Allocate an "espconn" for the UDP connection. #define USER_DATA                   "ESP8266 - Data"
The application should really perform some diagnostics in the above code in order to detect any errors and clean up where necessary. //  Basic UDP broadcast application for the ESP8266. //  Initialise the GPIO subsystem. //  Bit bang the data out as serial (SPI-like) data. //  Start the network connection. //  Setup timer to call the timer function. Compiling and deploying this application to the ESP01 generates regular (1 second intervals) messages on the console application at the start of this post. The journey with the ESP8266 has just started but it looks promising. 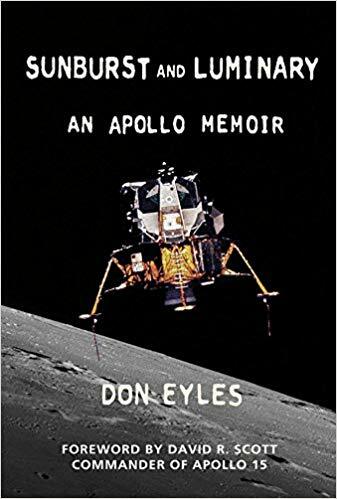 The initial set up was not a simple as I would have liked as there are a number of parts all of which need to be brought together in order for the development cycle to start. Once these are all in place then coding is relatively easy even though there is little documentation. The community which is developing is certainly helping in this process. On the whole this chipset offers an interesting opportunity especially with the like of Adafruit developing the Huzzah DIP friendly ESP12 board which has now received the appropriate certification for commercial WiFi use.